Nomahlubi Simamane, the founder of one of SA’s most dynamic SMEs, believes entrepreneurship will be the country’s saving grace. Before you can become an entrepreneur, you first need to put in the hard yards, be patient and work your tail off. But it’s even more important to have a dream and then go all out to acquire the skills and knowledge to pluck that dream out of the sky and plant it in the real world. It’s good advice, coming from someone who is living proof that it works – Nomahlubi Simamane, CEO and founder of South African company Zanusi Brand Solutions. 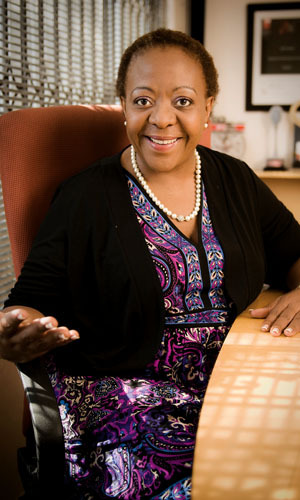 As the recipient of several industry awards – including being named businesswoman of the year by Black Business Quarterly magazine and Topco Media – Simamane’s knack for business and strategy saw her climb the corporate ladder before starting her integrated branding agency in Johannesburg 11 years ago. She studied biochemistry and went on to enjoy a stellar career in building brands for Unilever, British American Tobacco and BLGK Bates, including stints working in the USA and Kenya. Her star was undoubtedly on the rise in the corporate world, but slowly a seed started germinating in her mind: a yearning to run her own business. ‘From my studies I had learned to be a logical and analytical thinker, and to build a case, which proved useful in the business world. I had built up experience as a marketing director, but needed to understand more about communications,’ she relates. With this in mind, when Simamane was offered a lucrative and high-powered position at a major multinational, she instead opted to turn it down to gain experience in communications at an advertising agency– albeit at a much lower salary. But it was a strategic move that would eventually pay rich dividends. So, she took money out of her bond to open her own brand-building agency. And so Zanusi – which originates from the Zulu word for the high priest or priestess of sangomas – was born. Starting up a new business was a risk, but it has paid off handsomely. Simamane drew up a a ‘wish list’ of clients – and ended up securing business from an amazing 60% of them! Today she runs a successful small business that is 100% black-owned, employs a number of staff and has branched out into Africa. She currently has blue-chip clients such as BP, Medscheme medical aid and Nedbank. Her SME is regarded as an influential player in the branding arena. the Airports Company of South Africa’s brand repositioning. The agency also helped launch the first Pick n Pay Hyper in a township – the Maponya Pick n Pay in Soweto – while developing a blueprint to roll out stores in other townships as well. This trailblazer’s advice for young people heading out into the world is simple: ‘You need to get a sense of what you love doing, and that dream, that seed will already be planted in your mind when you go about collecting the skills base to move towards the achievement of that goal,’ she says. She strongly recommends devoting enough time to studying, on-the-job training or doing an apprenticeship in your chosen field before heading out into the big, bad world of entrepreneurship, guns blazing because in your eager naiveté you may get blinded by the stars in your eyes, and become easily disillusioned. Simamane calls this ‘paying your school fees’: taking the time to learn about your profession and steadily working your way through the ranks. If necessary, go and intern somewhere – even if you offer your services for free. So many school-leavers are stepping out into the job market with dollar signs glinting in their eyes, but Simamane cautions against becoming too materialistic. ‘When your only motivation is money, it very often happens that when the money is not there, the motivation is not either,’ she says. She believes that the saying ‘bigger is better’ does not always apply. As a small agency, Zanusi is lean and hungry, regularly competing – and winning – on the same playing field as the big boys. ‘We may be small as a business, but we bite!’ she confides. Be clear in your mind about what you want to do with your life. Don’t ‘faff’ around. Η Don’t stick with a particular study or career path if you know it’s wrong for you, even if you risk disappointing mummy and daddy. Once you have embarked with confidence on your dream career, have staying power – you’ll experience up days and down days, but need to pick yourself up, dust yourself off and soldier on. Don’t job-hop. Gain all the skills you need in a particular job before moving on. Self-confidence is essential: your mantra must be ‘I believe in myself and my abilities’. If you don’t have the necessary capabilities to fulfill your career dreams, then make a plan to acquire them. You have to be self-driven and self-motivated to succeed – don’t expect others to do it for you. Money is not the be-all and end-all. Keep reminding yourself why you are doing what you are doing, and keep reigniting that flame. It’s OK to make mistakes. It’s also OK to go backwards for the benefit of your longer-term vision. Always be excited about what you do. Be prepared to start at the bottom and work your way up. foundations, the world is your oyster! Interested in becoming a Enterpreneur? Visit entrepreneur career page for a career overview, qualifications needed, where to study, school subjects required and a career interview.